From all of us at the Gallagher Law Library, CONGRATULATIONS to the UW Law Class of 2018! We wish you the best of luck with the bar exam and beyond! Please know that graduating law students retain overnight access to the law library throughout bar prep. We'd be happy to see you-- even if you're a little stressed! Don't forget to also check out our new guide on WA state bar exam preparation, which provides a number of informational (and stress-reducing) bar-related resources. Finally, make sure to bookmark the UW Law Alumni page to remain up to date on all the latest in UW Law alumni news, events, reunions, and more. CONGRATULATIONS again to the UW Law Class of 2018! From that, the web managers can tell that their email marketing is doing its job because I went to their website from the email alert. We in the library biz tend to like the idea of seeking out reliable sources and basing decisions on what we find. But we aren't the only ones. 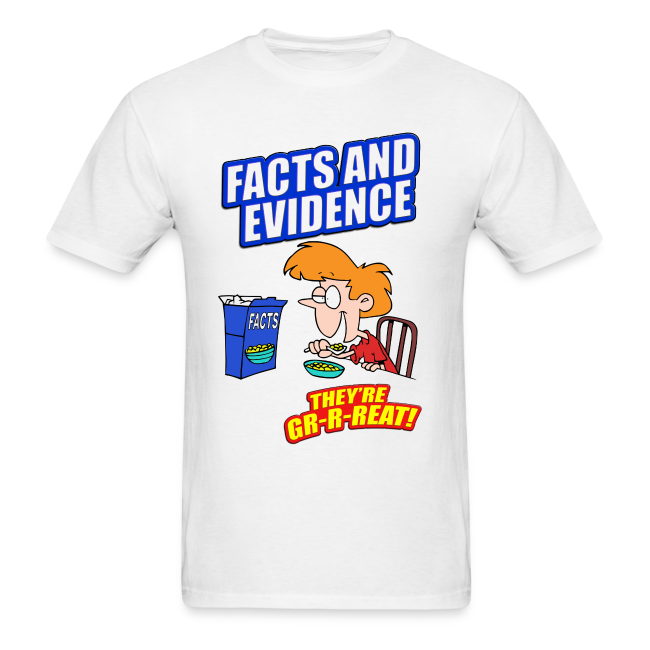 You can even find T-shirts to show your support, with captions like "Facts and Evidence: They're Gr-r-eat!" or "Demand Evidence and Think Critically." The Pew Research Center and the RAND Corporation—two non-partisan institutions many people trust for gathering and analyzing facts—are looking at American society's changing attitudes toward facts. RAND calls it Truth Decay, "the diminishing role of facts and analysis in American public life." You can download a report (326 pages! ), Truth Decay: An Initial Exploration of the Diminishing Role of Facts and Analysis in American Public Life (2018) to dig deep or you can explore the website for commentary and videos, Truth Decay and the Spirit of the Law, which was originally in the Daily Journal (California). Pew's project is called Trust, Facts and Democracy It includes lots of interesting reports on Pew's public opinion research. See also Facts Matter, from the Urban Institute. And if you'd like some data for your area of interest, check out our guide, Statistics for Law & Policy. Are you still frustrated with the Bluebook? Are you still frustrated with the Bluebook? Do you find yourself wondering what all those abbreviations mean and where they go? GOOD NEWS! LexisNexis has a resource that can help. LexisNexis Interactive Citation Workstation provides over 250 citation problems on the fundamentals of BlueBook citations. These questions will help you hone your Bluebook skills. This exercise set covers everything from case names to those perplexing signals. There is even a section on Law Review Citations. To access the LexisNexis Interactive Citation Workstation click on the window icon at the top left of the Lexis Advance Home Page. This will display a box of several of LexisNexis' modules, including the Interactive Citation Workstation. The Washington Style Sheet also gets a shout-out in the Washington specific exercises. You can get a free copy of the LexisNexis' version of the Style Sheet from the Lexis Nexis Store. For more tip and tricks see our Bluebook 101 research guide. Happy Law Day 2018 from the Gallagher Law Library! Per the American Bar Association, Law Day is held on May 1st every year to celebrate the role of law in our society and to cultivate a deeper understanding of the legal profession. This year's Law Day theme is "Separation of Powers: Framework for Freedom." You can learn more about Law Day and this year's theme on the American Bar Association's Law Day 2018 page.